I have a conditional greencard and am separated or am getting divorced from my U.S. Citizen spouse. What do I do? 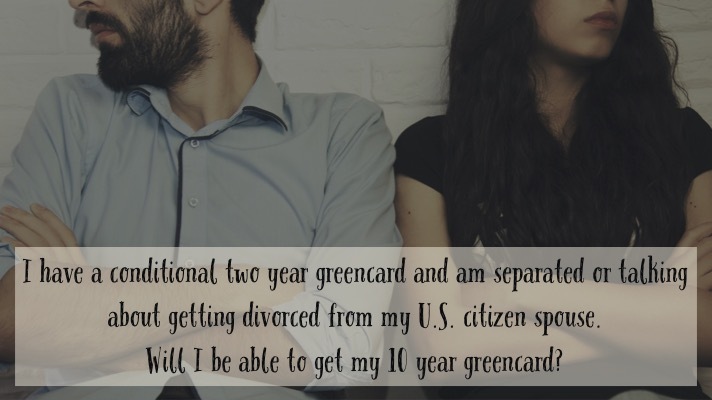 I have a conditional greencard and am separated or am getting divorced from my U.S. Citizen husband. What do I do? I married a United States citizen and got a conditional greencard. Now, it has been 2 years and I have to file to remove the conditions on the greencard to get my 10 year greencard. My husband/wife and I are separated, divorced, or talking about separating or divorcing. How will this affect my greencard? Any non-citizen who marries a United States Citizen and files for a greencard within 2 years of the marriage will get what is called a “conditional greencard.” This greencard expires after 2 years unless both the husband and wife jointly file Form I-751, Petition to Remove Conditions. The purpose of filing this petition is to prove to the government that the marriage was not fraudulent when the marriage started. The husband and wife must submit evidence in the form of joint bank account statements, affidavits, joint mortgages or leases, text messages, photos, and more during the two year conditional residency period. Often, an interview is required. At the interview, the adjudicator will look at the evidence provided and ask questions to determine whether the marriage was fraudulent at the time of the marriage. Like any U.S. Citizen couple, an immigrant spouse and a USC spouse sometimes find that they are not compatible with the person they married. Many marriages end in divorce after two years. So, how does that affect an immigrant with a conditional greencard who is within the first two year period. Well, it depends on the status of the marriage. If you are legally separated, then USCIS cannot adjudicate the I-751 Petition. The immigrant spouse would have to apply for a waiver of the joint petition requirement. 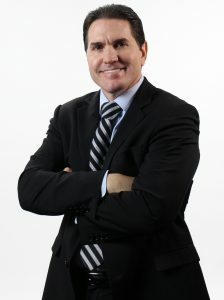 If you are not legally separated but only physically separated and the spouse agrees to cooperate and file the joint petition and go to the interview (if required), USCIS can still adjudicate the joint petition, but they will use the separation as potential evidence that the marriage was not bona fide (or real) at the time the marriage was entered into. If an immigrant spouse is certain that divorce is going to occur, then it may be better to go through with the divorce prior to filing the I-751, by filing an I-751 waiver (discussed below). What if my conditional greencard is about to expire? Timing is critical when it comes to filing an I-751 to remove the conditions of a greencard. If you fail to file a joint petition prior to expiration date on the conditional greencard (2 years after initially granted), then your lawful permanent resident status (greencard) expires and you will be out of status. Therefore, it is critical to file the I-751 within the two year conditional residence period. You can file up to 90 days early. Many times, the couple file a joint petition to remove the conditions and then initiate divorce proceedings. If a divorce becomes final before USCIS makes a decision on the petition, you may be able to convert the filing to a waiver request. These are complicated, strategic timing issues that need to be discussed with an experienced immigration attorney. What waivers are available if I am separated or getting divorced? There are three waivers available to the immigrant spouse if they are separated, getting divorced or are divorced from the U.S. citizen spouse. Divorce – If the immigrant spouse is divorced from the U.S. citizen spouse, the immigrant spouse can file the I-751 and request a waiver. The immigrant spouse must still prove that the marriage was real and not fraudulent. Extreme Hardship – If deportation would result in extreme hardship, the immigrant spouse can file the I-751 and request this waiver with proof that the hardship would be extreme. Battered or Extreme Cruelty – If the immigrant spouse was battered or subjected to extreme cruelty by the U.S. citizen or Lawful Permanent Resident spouse and the marriage was entered into in good faith. What if my greencard expires?